This book contains tips, tricks and advice from short track master Butch Miller, 3-time ASA champ. 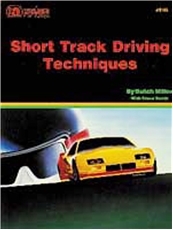 Includes: Basic competition driving, learning a new track, tips for driving traffic, developing a smooth and consistent style, improving lap times, developing a winning attitude, defensive driving tactics, offensive driving techniques. For new and experienced drivers. Over 125 illustrations.